The original recipe, found in the Fou de pâtisserie magazine #10, is by chef Laurent Favre Mot, who is from Marseille but moved to Paris in March 2015. He’s said to be talented, innovative and covered in tattoos. Some of his cakes include a skull and apparently visiting his pâtisserie is like a breath of fresh air. Anyway, his recipe is brief (mix, heat, coat, etc.) presuming a lot of prior knowledge so I’ve added some explanations to help us all along. 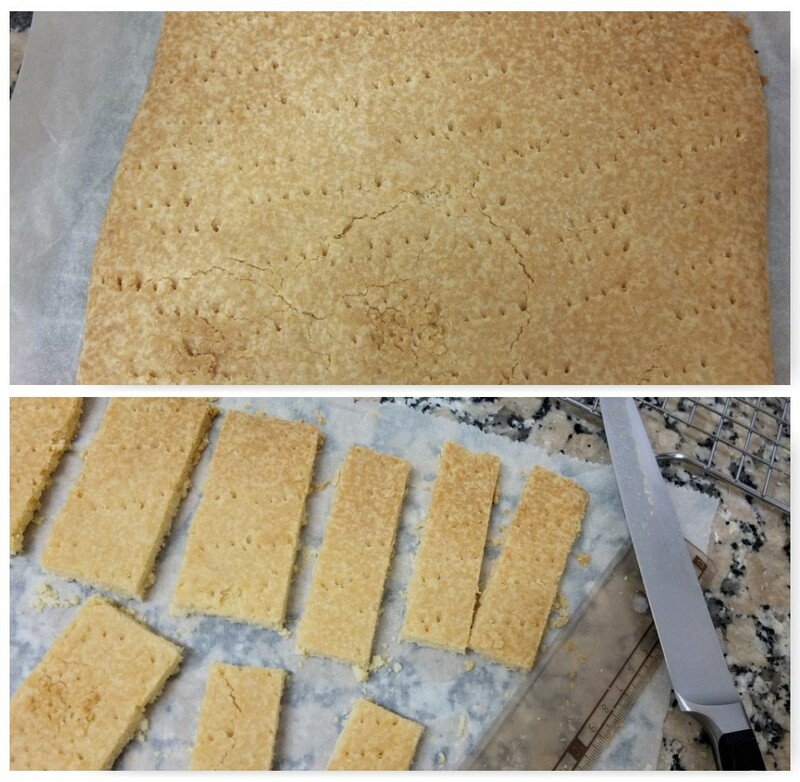 I also adapted some of the method and quantities, and reduced the sugar intake by using xylitol in the shortbread and spelt flour. Though you do need real sugar for the caramel. 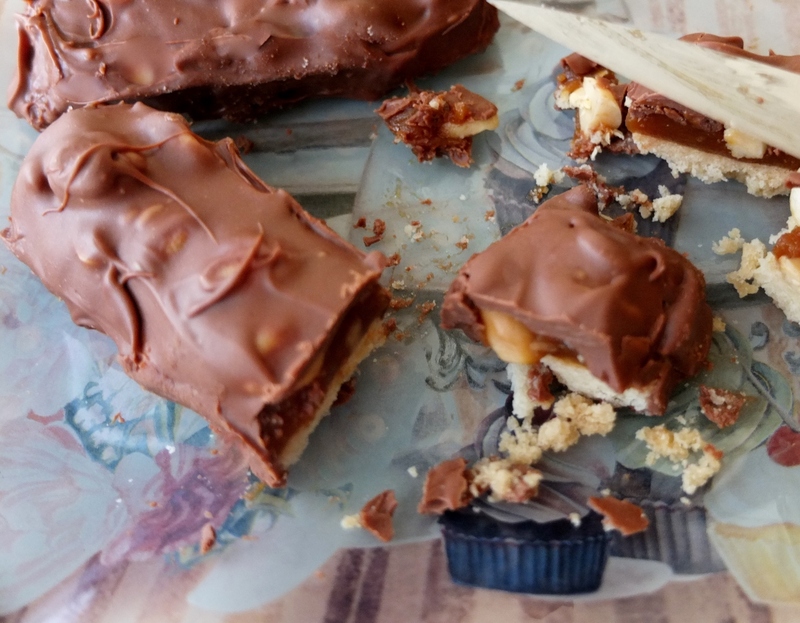 Timings: shortbread – 10 mins to make and 20 minutes baking in the oven; caramel – 15 mins then 1 hour cooling; assembly – 20 to 30 mins (with 1 hour cooling before coating in chocolate) 45 mins to 1 hour’s work. Preparation: Preheat the oven to 180°C/350°F (static, non-convection oven) or 160°C/320°F (fan-assisted). Rub the butter into the sugar and flour till the mixture is like breadcrumbs. 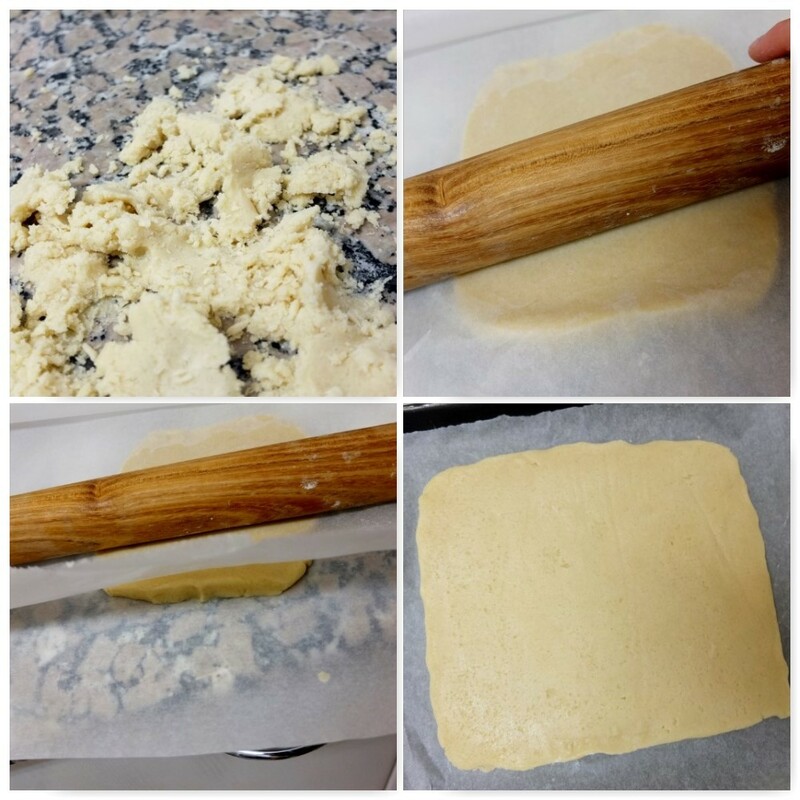 Fraiser on a smooth surface with the palm of your hand (see my making pastry page). Make a ball then roll out between two sheets of greaseproof paper to a height of 5 or 6mm/less than a quarter of an inch. Your rectangle can be about 18x20cm (7x8inches). Make sure it’s an even height all around then place on a baking tray lined with greaseproof paper and bake 20 to 25 minutes. Trim the edges to make a neat rectangle with straight sides then use a ruler to mark out 16 even pieces (approx. 9cm by 2.5cm) – not like in the photo where I was experimenting with sizes! 1. Heat the cream in a saucepan till just before simmering and reserve for later use. 2. 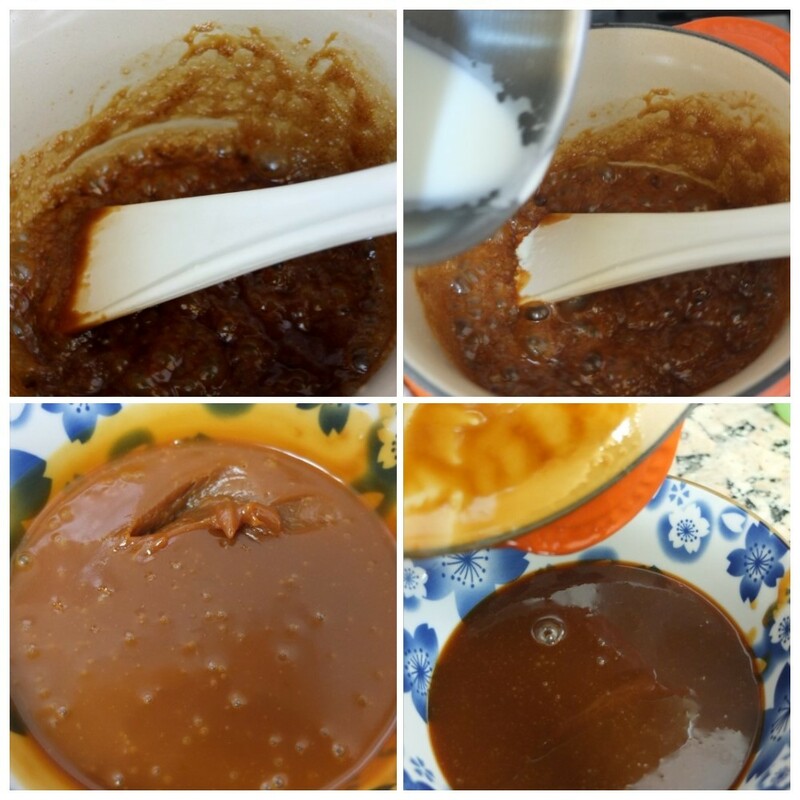 Make the dry caramel by placing the sugar in a small heavy-based saucepan over low-medium heat. Don’t stir it. Never. You can shake it around a little but not so much it goes high up the sides. 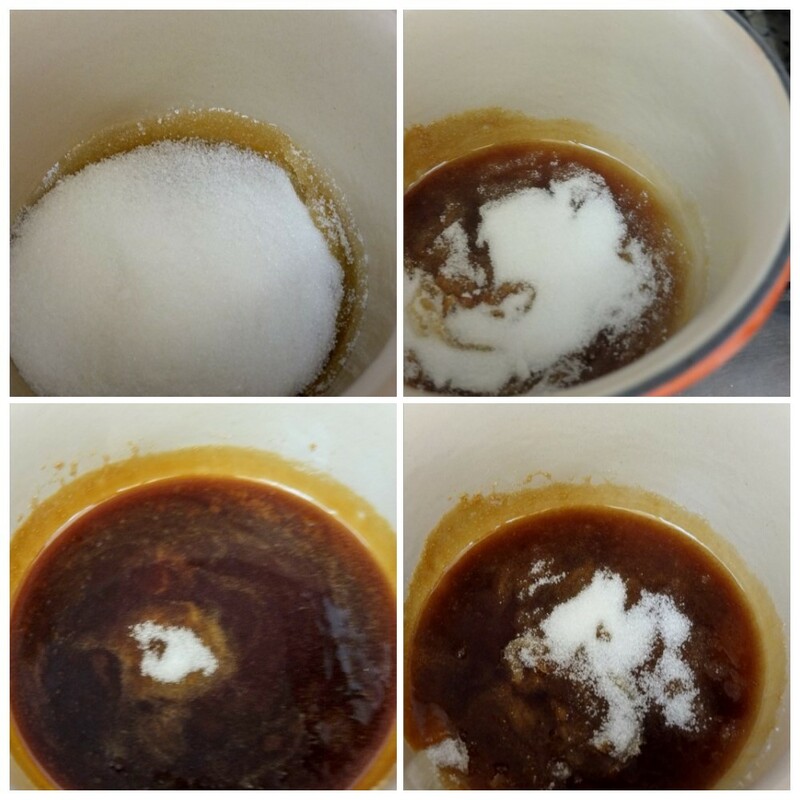 After 10 minutes or so the sugar will have gradually dissolved. If it starts going dark or smelling like it might burn, just lower the heat or take it off and swirl until the sugar has dissolved. 3. Place the 2 sheets of gelatine on a small high plate and cover them with a little water so they soften. 4. Now slowly stir the warm cream into the caramel, in a steady stream. It will bubble up so do this gradually. 5. When it’s all combined stir in the remaining ingredients. Pour into a small clean bowl and store about 1 hour in the fridge till it’s cool and thick. Place your biscuits on a wire rack, spaced apart. Pipe the caramel onto each biscuit (with a medium no.8 nozzle and piping bag). Then press in some peanuts. You could also press in raisins or other dried fruits. Place in the freezer for 1 hour or in the fridge till firm enough to be coated with chocolate. 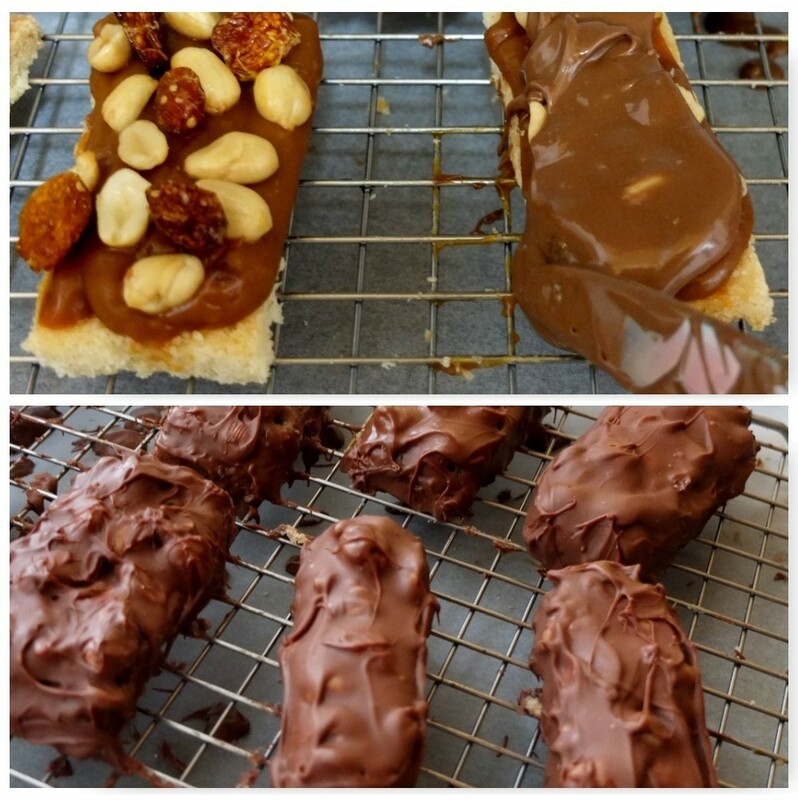 When the biscuits are ready, melt your chocolate over a bain marie. Then you can temper the chocolate (optional) if you’d like your chocolate to stay shiny. though your stomach really won’t notice. Instructions are on my tempering chocolate page. When the chocolate is ready spread a thin layer under each biscuit with a butter knife and place gently back on the wire rack. Then pour some over each biscuit and spread with a butter knife or spatula. The less you touch it with your knife or manipulate it the shinier it will be, so try to be fast. Place in the fridge to set for an hour or so. Then eat! 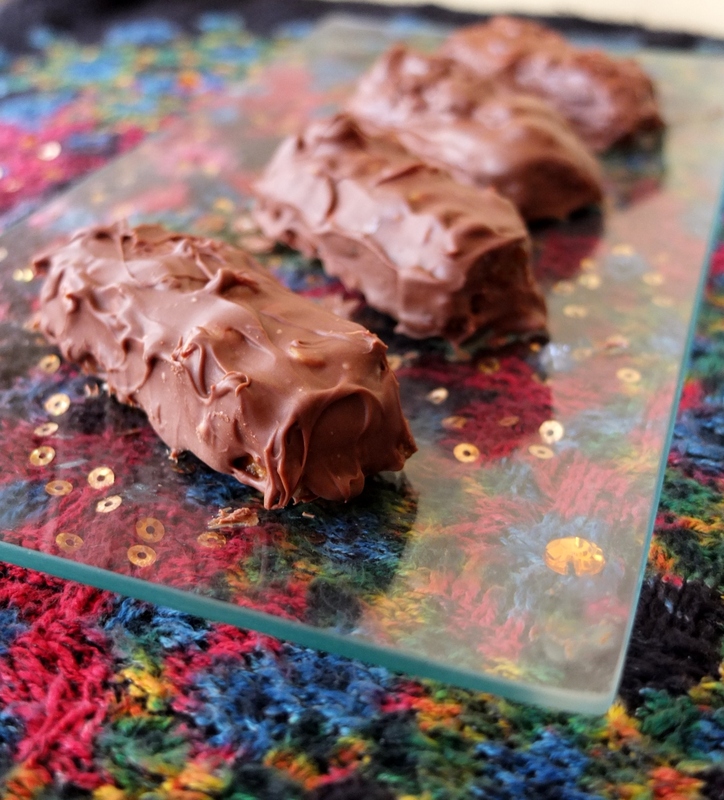 Hope you enjoy these little pâtisserie chocolate bars and feel inspired to rustle some up too! You can play around with the ingredients, coating them with dark chocolate if you prefer. 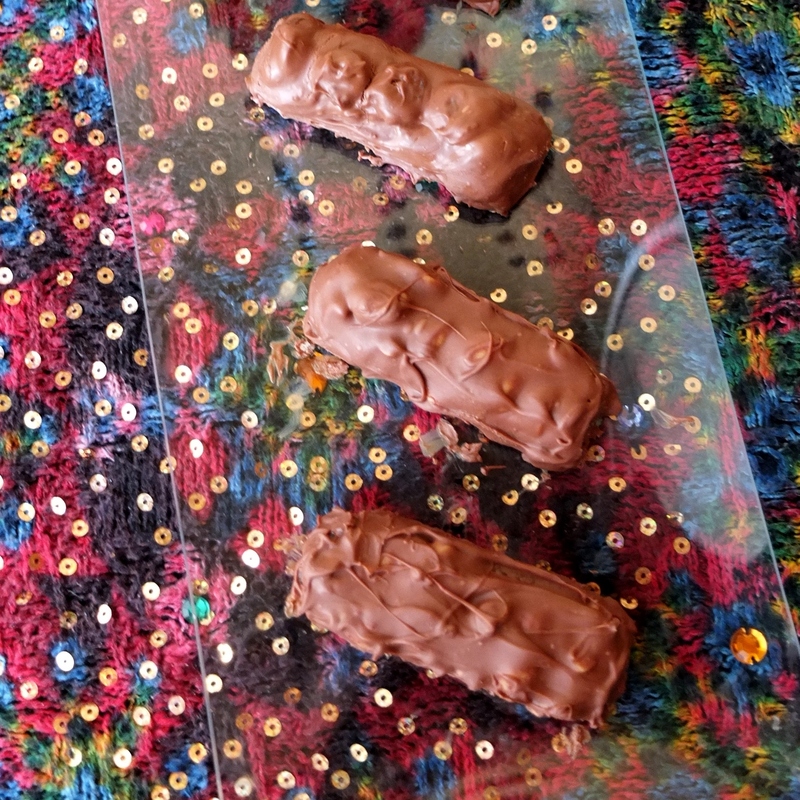 So these little chocolate bars are off to the lovely and sociable Fiesta Friday hosted by Angie@thenovicegardener and her co-hosts Loretta@Safari of the Mind and Jess@Cooking Is My Sport. And also to Recipe of the Week hosted by Emily@aMummyToo. They’re also going to the August Perfecting Patisserie challenge hosted by Lucy@BakingQueen74, Tasty Tuesdays hosted by Vicky@HonestMum and Fabulous Foodie Fridays hosted by Lucy@BakePlaySmile and Lauren@CreateBakeMake, Hope you’ll all visit and mingle. And help yourself to a little le Snickers chocolate bar! These Snickers (I remember them well as Marathons!) look so good, I bet they taste so much better than the original, being handmade with such care. Thanks for linking them up to #PerfectingPatisserie! These look positively irresistible! 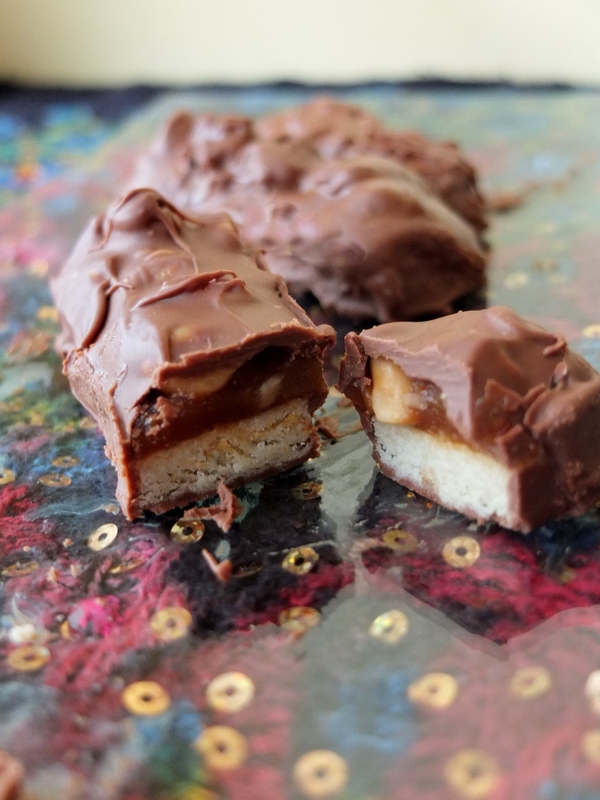 I love Snickers, but have never tried my hand at creating a homemade version. I bet they’re incredible!